Irish Motifs. How to make a Skirt. Using Irish motifs for making a skirt you can be pretty sure that no one else has exactly the same one. The reason is quite simple. Even if you decide to crochet two the same skirts, they will look differently. To make a skirt from motifs is a creative process. This kind of garment can not be a subject of a mass production by its nature. Perhaps opportunity to feel yourself like an artist is one of the most attractive features of working with crochet motifs. Our skirt will consist of Irish motifs assembled in a skirt with a help of net. In other words, we are going to use Irish crocheting technique to make a skirt. Wait, wait! It is too early to leave this page! :) Irish crocheting is not that difficult as it seams. A little bit of patience and a lot of desire to get it done that's all we need. For the beginning, please go through the Motif Pattern page to get an idea what namely we are going to do. Ready? Let's continue. Information presented below is not a law. You can either accept or just skip it if you have your own ideas about the way a crochet skirt of Irish motifs has to be done. The purpose of presenting it here is to make your first experience with Irish crocheting as much positive as possible. Connecting of Irish motifs with the help of a crochet net is not the simplest technique of crocheting, BUT IT IS DOABLE. And the most important, the result is certainly WORTH the time invested in it. Here are a few practical advises which will help you to avoid many troubles while joining Irish motifs using a net. For the beginners it is easier to use cotton yarn. But generally any kind of yarn which has length about 450 m-600 m per 100 g will work. Don't waste your time using pure acrylic or mix with more than 40-50% of acrylic yarn. It doesn't keep shape and your Irish crocheting won't look neat pretty soon. The number of a steel hook is between 0.7 and 2 mm. Choose the one which allows you to crochet tight enough, but still doesn't require significant efforts to do it. Crochet tight, but have a pleasure at the same time. As a rule, yarn for a net has to be thinner than for motifs. Hence, a smaller size hook has to be used. But once again, there are no rules which can't be violated. Crocheting a net, try to use not only chains for connection, but double, treble crochets, and other stitches also. It will, help to create a better quality net. Holding the crochet hook. There are no rules which method is correct. Either Pencil/Underhand method or Knife/Overhand method for crocheting motifs will work, BUT Knife/Overhand method is much more productive for crocheting a net. How to crochet a skirt using Irish motifs. Instruction. Read this step-by-step instruction from the very beginning to the very end to get the idea. If the process of crocheting a skirt looks too complicated for you, it might be not a bad idea to choose some smaller project: a girl top or just a coquette for a dress. Anyway, follow the instruction. For this project you will need a full scale skirt pattern made accordingly to the measurements of your body. How to make it you will find out at the Skirt Pattern page. A skirt pattern is a base which we are going to use to lay out the motifs. You can use a skirt pattern the way you see it on the picture OR draw back and front parts separately OR draw back and front part together as one piece. 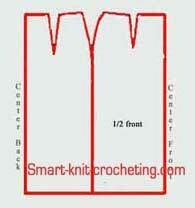 Draw a skirt pattern on a paper first and use it as a templet for other crochet/knit projects. For this project you will need a pattern made on a cotton fabric. Because it is not just a pattern, but actually a "tool" which helps you to maintain a proper tension of the yarn, to make a net crocheting process easier. Here is how to do it. Take several plies of the cotton fabric (some old bedding can also be used) and cover a little greater area than a skirt pattern. It is better if the top ply has different than motifs color. Iron a base to make it smooth. Place a paper pattern on the top and go over it with a pencil or chalk. A base is ready. Lay out Irish motifs on a fabric base placing them upside down (wrong side up). Use your imagination to create an attractive composition. Don't be in a hurry. Move motifs the way they look the best. Pin them to the base if necessary. In case you've planned to make a warm skirt, keep motifs closer to each other and leave less space between them. If it is going to be a summer variant, leave larger distances between them to be filled with a crochet net. Laying out motifs remember that you will still need to make a seam to form a skirt "tube". 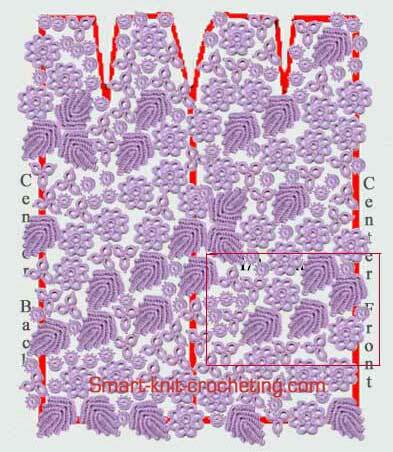 Overlay a skirt pattern line to make a crochet fabric look uniform and future seam invisible. Don't overlay the dart lines. It will be easier to add some additional motifs later instead of taking out joined motifs when you find out they don't have to be there. Important note. If you used cotton yarn for crocheting, to avoid unpleasant surprise after a skirt is finished, steam each motif or the blocks of a few motifs sewed together before laying them out. Cotton has a tendency to shrink when subjected to washing. Tightly sew all your motifs to the base with a thread (better cotton) and a needle. (Later, when some experience comes, you might consider not to sew all motifs to the base,but just hold them using pins only.) Remember though that it is only temporary and thread has to be pulled out after a skirt is finished. Now your composition is ready for crocheting a net. Choose an aperture you would like to start from (See that red grid on the picture), take a thread and start to form a net. Crochet tight, but don't pull too hard keeping your work flat (that's why you need that thick fabric base). It is not very easy for the beginners, but there are a few important moments to remember all the time which will help you. To form a net use different elements: chains, double , treble crochets whatever will make it look neat. Working in a chosen aperture, crochet a net along its the shortest direction. The small groups of Irish motifs can be sewed together before placing them on a fabric base. There is no need to break the yarn while moving from one aperture to another. For the most cases a few additional stitches can be done over motif to start a net in the next area. Neatly weave the ends of the yarn into the completed skirt. Depending on the type of yarn you used, slightly steam a skirt or just put a wet fabric on it and let it dry. Perhaps it was not easy work if you tried to do it. But I am sure after taking this challenge you realized that there is no limit for perfection. The most important is that fact that IT CAN BE DONE AND YOU CAN DO IT. In case if after a few attempts of crocheting an irregular net you failed and decided: "Not this time...", there is another a simpler variant of using crochet motifs. I call it "A lazy Irish crochet" (a page is coming). Check it for the inspiration and come back.